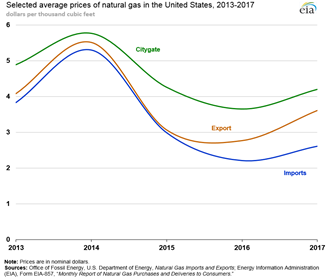 The 2017 Natural Gas Annual shows U.S. dry natural gas production rose to a record high in 2017, while consumption declined year-to-year for the first time since 2009. Domestic dry natural gas production of 27.3 trillion cubic feet (Tcf), or 74.8 billion cubic feet per day (Bcf/d), in 2017 was 2.6% higher than the 2016 level of 72.7 Bcf/d. Louisiana saw the largest total gain by volume in annual dry natural gas production, increasing 20.9%, from 4.76 Bcf/d in 2016 to 5.77 Bcf/d in 2017. Arkansas saw the largest total decline in production, decreasing 14.1% from 2.25 Bcf/d in 2016 to 1.94 Bcf/d in 2017. Deliveries of natural gas to consumers in 2017 were 24.8 Tcf, or 68.0 Bcf/d, a decrease of 1.5% from 2016 deliveries. A decrease in the electric power sector drove this national decrease. Deliveries to the electric power sector decreased by 7.4% in 2017 to 25.3 Bcf/d. Deliveries to residential consumers increased by 1.5% between 2016 and 2017 to 12.1 Bcf/d, and deliveries to commercial consumers increased by 1.8% to 8.7 Bcf/d. Deliveries to industrial consumers increased by 2.9% to 21.8 Bcf/d, the highest volume since 2000. For the first time, the United States was a natural gas net exporter (exports minus imports) in 2017, exporting 125 Bcf more natural gas than it imported in 2017. 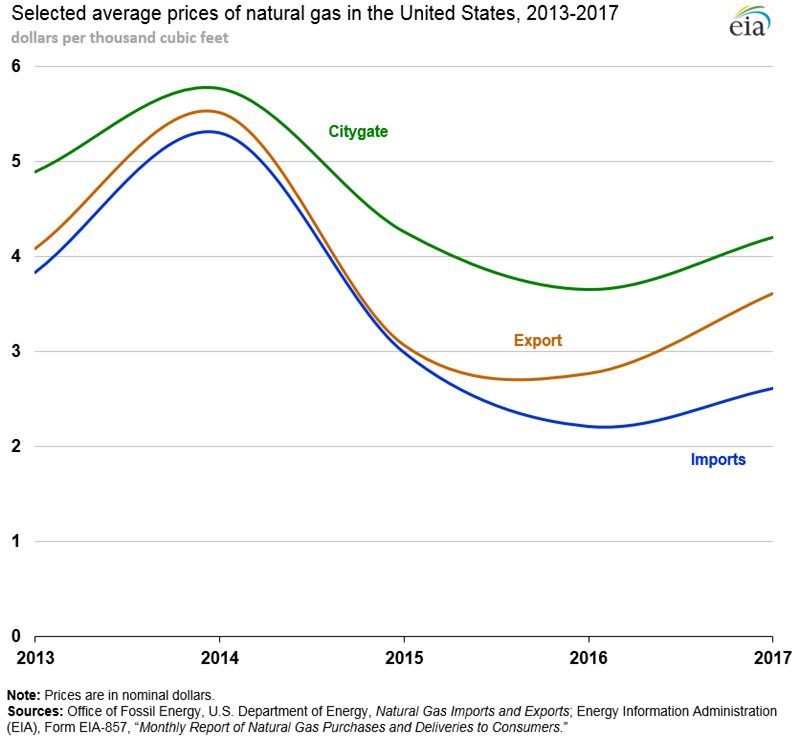 U.S. natural gas imports increased between 2016 and 2017 for the third consecutive year. Total imports of natural gas in 2017 were 3,042 Bcf, an increase of 1.2% from 2016. Exports of natural gas also increased year-to-year for the third consecutive year, from 2,335 Bcf in 2016 to 3,168 Bcf in 2017, an increase of 35.6%. Exports of natural gas between 2016 and 2017 experienced the largest year-to-year percentage increase since 2002. Annual Natural and Supplemental Gas Supply and Disposition Company level data (1997 to 2017) as reported on Form EIA-176 and detailed annual data (2005 to 2017) of storage field capacity, field type, and maximum deliverability as of December 31st of the report year, as reported by operators of all U.S. underground natural gas storage fields are provided in the Natural Gas Annual Respondent Query System.